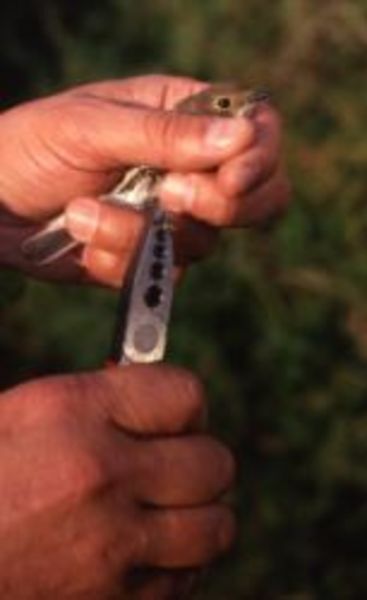 Bird ringing is an indispensable tool for ornithological research. The IAR is home to the bird ringing centre for the German states of Lower Saxony, Bremen, Hamburg, Schleswig-Holstein, North Rhine-Westphalia and Hesse. At present, 242 voluntary members work within the ringing programme of the IAR. Specific projects are either performed by the institute itself, or closely supervised by the institute. About 60% of all ringing currently occurs within IAR-initiated projects, while c. 25% occurs within general projects. In total, about 100,000 birds are ringed with the institutes ‘Helgoland rings’ every year, and about 15000 rings are reported. Of reported rings, about 1000 are from foreign ringing centres. So far, over 9 million birds have been ringed with rings of the institute, which has resulted in more than 200000 ring reports. All ringing and ring reporting data are processed and archived in a specifically designed ORACLE-based database. The IAR organises an annual course, which is mandatory for new ringers and allows established ringers to share and extend their knowledge.